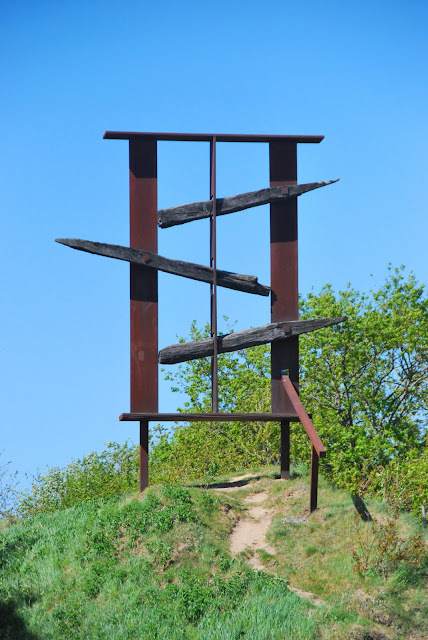 out on a sunday drive, we came across a sculpture park in an old gravel pit. one wouldn't normally think that's the most charming place for art, but this was art on a large scale - art using enormous pieces of metal, wood and stone. landskabsskulptur i tørskind grusgrav - landscape sculpture by sculptor robert jakobsen and his former student jean clareboudt. it was this one that we could see from the road that got our attention and made us stop. you can get an idea of the size in relation to the car in the background. the sculptures incorporate natural elements of wood and stone together with large-scale sheets of metal. it was especially interesting when you consider the differing decay rates of the materials. on this sculpture, i'm sure they must regularly replace the wood. and surely the decay is part of the charm. this one would be the perfect setting for a fashion show, as it was like catwalks on the three sides. the best part about the sculpture was not the setting, nor the scale of it, but that you could touch it and climb on it and feel a part of it. the shapes were dramatic and several took advantage of the setting of a former gravel pit. this one, jutting out dramatically, was a good 30 meters above as i stood on the gravel below. quite a contrast to the blue sky and the sunshine. a marvelous intersection between man made and nature. my heart just about stopped when i zoomed out and saw husband was balancing on the heavy beam, as it was quite a drop. quite surprisingly, there were no signs, warning people to be careful. but i guess in denmark, people both generally have common sense and are not litigiously-inclined. it wasn't easy for me to see husband peeking out up there (i was very zoomed in to get this shot) at least 30 meters above the ground. but i love the idea that he became part of the piece. worse yet, when i got up to the top and found sabin was out there too, tho' she had crawled along the beam, not walked it. i was happy i didn't see that. this photo in no way does justice to how far they were from the ground. the chance to be part of the art in this way is one that happens too seldom (i just had a conversation about this in the past week with the fabulous lisa). most museums and galleries don't let you touch the art, much less climb around on it and get to feel a part of it. so tho' it made my hands and feet sweat, it was a marvelous chance. i had a pretty hard time tearing the two of them away from this one. but that's how we should always feel about art, don't you think? we'll definitely be going back. That is brilliant. So much of classic art is untouchable, to have some near you that you can actually connect with on an extra sensory level is wonderful. The outdoor Olympic Sclupture Park in Seattle has a number of metal (and stone, wood) scluptures - all with "hands off" signs. In fact, there's a SWAT team permanently encamped in the shrubbery near a large Richard Serra metal sculpture. We lose a lot of tourists who casually touch bare metal. I think there's an unusually high loss of Danes in that park. it looks like a great day and adventure. i love textural things like this.